• Authorities say there is a historical debt. The spring water passing to Chile is an average of 180 liters per second, water that this country consumes for more than 100 years, free. International law expert Iver Bon-vorries suggests that the 13 point Agenda is left untreated until the ICJ ruling. While some regions are suffering the effects of drought, northern Chile benefits with free water from the Silala spring for over 100 years, and the historical debt remained only as payment intentions by the Chilean governments. National authorities and researchers said that Chile is making an arbitrary and abusive use of the waters of Silala, that start in Bolivia. Through the artificial channels, an average of 180 liters per second goes to Chile and that has to be compensated. 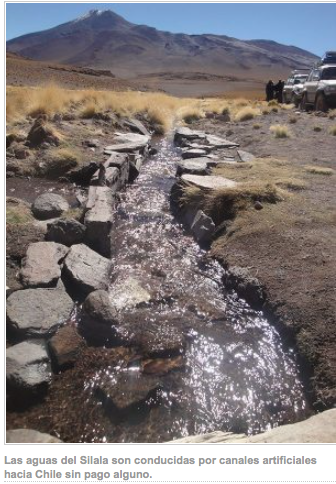 In addition, a study defines that the Silala water are owned by Bolivia and no other nation; since it is not a river of successive course but a spring which rises in the country. The research also claims that Chile used without payment, some 50 million liters of water each day from the Bolivian spring, or 50,000 cubic meters / day, and not pay a penny to our country. Meanwhile, several regions in Bolivia suffer drought in rural areas and urban centers. Such is the case of the city of Tarija, where inhabitants of 28 neighborhoods and communities surrounding it, begin to feel the shortage of drinking water for human consumption. So, some citizens ask national authorities if the flow emanating from springs should be for Bolivians or will be still consumed by Chile for free. On the other hand, the expert in International Law, Iver Bon-vorries said the 13-point Agenda, which includes the issue of Silala, will stay frozen for the duration of the court proceedings in the International Court of The Hague. This entry was posted in Bolivia, Business, Economics, Environment, Politics, Social Unrest and tagged 1879 Pacific war, Chile, invasion, law compliance, water. Bookmark the permalink.